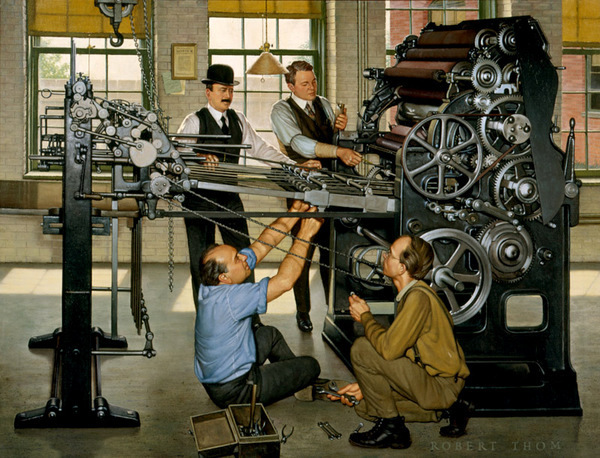 Illustrator and painter Robert Thom’s depiction of the invention of the offset printing press by Ira W. Rubel and his assistants in Nutley, NJ in 1903. In preparing this brief sketch of the life of Ira Rubel and his invention of the offset printing press—an extraordinarily important event in the history of modern print technology—it is evident that nothing much has changed since Soderstrom’s time. To this day, there is little accessible and authoritative information about Ira Washington Rubel: his work or his life. In fact, most of what is easily found either trivializes Rubel’s contribution—as bumbling or happenstance rather than the work of an earnest inventor—or glosses over its historic significance. There is currently no biographical Wikipedia entry on the man and his accomplishment; photos of Ira Rubel are very hard to find. Ira Washington Rubel was born in Chicago on August 27, 1860. He attended Hayes and Division West High Schools in Chicago. He graduated from the University of Chicago in 1881. Rubel then attended Northwestern University in Evanston where he was a classmate of William Jennings Bryan and graduated with a Bachelor of Law in 1883. He litigated cases as a practicing attorney for a short time in Chicago. The printing firm Rubel Brothers—which Ira founded along with his brother Charles in 1881—is listed in the Lakeside Annual Directory of the City of Chicago of 1887. During the 1880s, Ira became known for having been a pioneer in the manufacture of loose-leaf systems. Promoting the systems for the maintenance of business transactions records, the Rubel Loose Leaf Mfg. Co. was established on Superior Street in Chicago. Advertising by the Rubel Company in a Chicago business publication. By 1899, the Rubel brothers’ firm acquired both a six story building on Wabash Street in Chicago as well as a paper mill. At some point, Ira Rubel and his three brothers expanded to the east coast and established an office on Broadway in New York City. They also opened a lithographic printing and paper mill facility in Nutley, New Jersey. By 1901, the Rubel Brothers Paper & Manufacturing Co. on Kingsland Street in Nutley, NJ experienced significant growth and expanded its facilities. It was at this plant that Ira would conduct his experiments, discover the offset printing method and build the first offset lithographic printing press. Offset printing is also known as “indirect” printing, i.e. the printed image is not applied directly to paper from the printing plate or inked image carrier, but is first transferred to a rubber blanket and then to paper. Although indirect ink transfer had already proven its importance for at least 25 years in tinplate (canned goods) printing, the concept was not obvious in paper-based lithographic printing due to the dominance at the time of the letterpress technique especially in typographic reproduction. Perhaps one of the reasons for the lack of literature on Rubel’s discovery is the fact that the offset method was the result of more than fifty years of seemingly disconnected technological developments in both typographic and pictorial reproduction. In 1875, Robert Barclay of Barclay & Fry obtained an English patent for the very first offset press that transferred the printed image from the lithographic stone to a cardboard surface and then to sheet metal (used in making biscuit tins). The discovery of halftone photographic and process color reproduction in the 1880s was also a factor that motivated the invention of offset. In 1903 and 1904 Rubel experimented at the Nutley facility with photo reproductions transferred onto lithographic stone through a screen. Although the testing did not yield significant results, Rubel’s work on a stop cylinder press led inadvertently to an important breakthrough. When his assistant miss fed a sheet and the rubber impression roller came into contact with the lithographic stone, the reversed image was transferred this roller. When the next sheet was fed, it had an image on both sides: one that was product of the direct contact with the stone image carrier as intended and the other with a wrong-reading image from the “indirect” rubber roller. Once the “indirect” image was found to be superior in quality to the direct one, Rubel and his collaborators expanded their testing along these lines and perfected the technique. This included a complete redesign of the press based upon the offset principle. 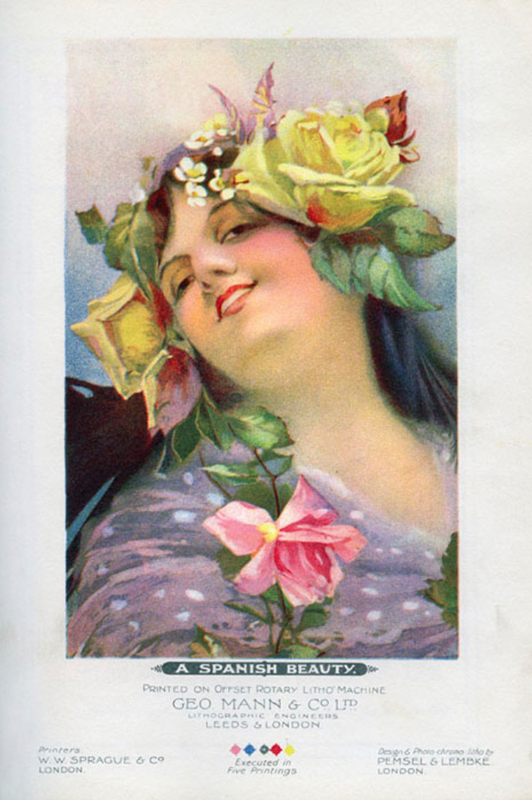 One of the first process color prints produced on an offset press. 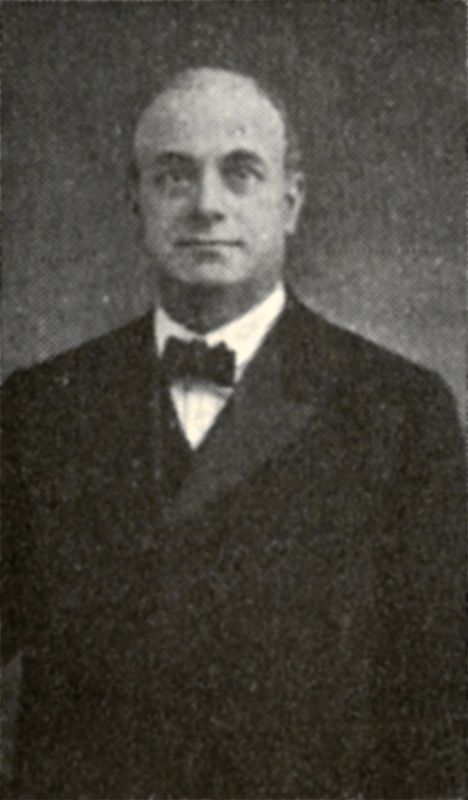 It appeared in Penrose’s Annual Pictorial in 1910. As Ira was convinced of the importance of his discovery, he returned to Chicago to seek the technical assistance of lithographer Alexander B. Sherwood. The two also enlisted the financial support of Andrew Kellogg of New York as a venture partner. Although the arrangement did not last, three presses were built and each man took one of them as their share of the achievement. Court rulings made it impossible for Rubel to obtain a US patent for his discovery because the pre-existing use of the offset method by tinplate printers was legally invoked. Therefore, each of the partners—Rubel, Sherwood and Kellogg— went their separate ways with the new invention. The Kellogg Offset Press was built in New Hampshire, Sherwood joined the Potter Printing Press Company of Plainfield, NJ and Ira Rubel took his idea to England where he thought he might obtain a patent for it. In 1906, Rubel met the New Zealander Frederick Sears and together they launched what became known as the Sears “Highlight” process. There is no doubt that Ira Rubel’s invention—and the independent and concurrent work of Charles and Alfred Harris of Niles, IL—came to transform the printing industry worldwide. The offset lithographic process was greeted initially within the industry with mixtures of enthusiasm, skepticism and opposition. As with many previous and future breakthroughs in the graphic arts, there were those who could see offset’s potential and those who were advocates of the dominant letterpress of the previous technology generation. It would take fifty years before the superior quality, speed and economics of offset overtook letterpress as the dominant printing method internationally. By 1960, the majority of printed matter was being produced on offset equipment. Today, with digital printing systems advancing rapidly in recent decades, offset still represents more than half of the $800 billion of worldwide annual printing shipments. More than a century after Ira Rubel’s invention, the dominance of offset printing will continue for many years—some even say decades—to come. This entry was posted on November 14, 2012 at 12:39 pm and is filed under People in Media History, Print Media with tags I. W. Rubel, Ira Rubel, Ira Washington Rubel, Loose leaf system, Offset lithography, Offset printing. You can follow any responses to this entry through the RSS 2.0 feed. You can leave a response, or trackback from your own site. How fun. No wonder I print, and use 125 year old presses. Ira turns out to be an ancestor. I am doing research on my family and would to compare notes and if nothing else, see were you fit into the family tree. I just saw your comment here. If I did not respond before, you can write me at scott at scottrubel dt com. There’s an old photo showing Rubel Brothers on S. Dearborn St. in the Chicago neighborhood now known as Printers Row. I guess it makes since that they would have been located within the area that became Chicago’s printing industry hub. The image where you can see the Rubel Brothers sign is in a photo of the Pontiac Building located on the NW corner of Dearborn and Harrison Streets. The Pontiac Building stands today. The building showing the Rubel Brothers sign is to the north of the Pontiac Building and looks to be the building known as the Duplicator Building (also still standing). In between the Duplicator Building (Rubel Brothers) and the Pontiac Building is the Morton Building. The Morton Building was completed in 1896 and served as the offices of the Morton Salt Company. The image showing the Rubel Brothers sign is from 1893 before the construction of the Morton Building. Both the Morton and Duplicator Buildings are now a hotel. The hotel is presently called The Blake, but was previously the Printers Row Hyatt. I don’t know how long the listing will be up but I’ll put the website address below in case anyone wants to take a look. Thank you for your comment and link. The photograph of the Rubel Brother’s business on South Dearborn Street in Chicago is an important historical confirmation of the fact that the Rubels were established manufacturers in the printing and paper business at least a decade before the development of offset printing in Nutley, NJ in 1903-04. Furthermore, the image helps to dispel the myth that Ira Rubel somehow “stumbled” upon the offset method as an odd technical accident. Although I have not yet found the cause of their relocation to New York City (and Nutley, NJ), I think it is clear that the Rubels were established businessmen and that there is every reason to believe the invention of offset printing was the result of deliberate efforts in an increasingly competitive printing market at the turn of the twentieth century. Where is this old photo?